Series 7 brushes are Winsor & Newton's highest quality sable brushes. 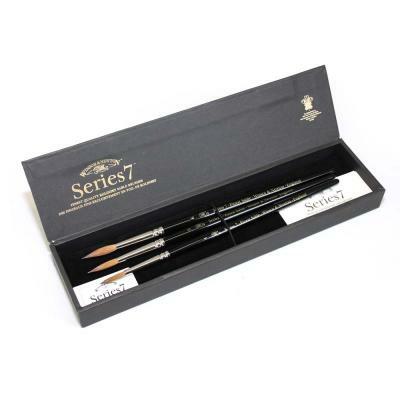 This set of three brushes size 4, 5 and 6 come in a superb black presentation box and make the perfect gift for any watercolourist. These brushes bought separately at full recommended retail price are £130.40 and now available at £87.50 in this beautiful set! After finally getting around to using these brushes, I am sad to say that they are not what I expected. Perhaps the price was too good to be true, but I find all of the brushes in this set to fall way below my expectation, for one glaring fault - they do not hold a point. The #4 is the best of the bunch, but the #5 and #6 are both splayed at the end after wetting and removing the excess water. I have much cheaper sables than these that perform a lot better. For the claim made about these brushes, I am bitterly disappointed. Perhaps these are seconds and are packaged in the set at an attractive price, but they are still not worth the money. We have now checked the brushes mentioned and they are faulty. Sorry about the inconvenience, and replacement Series 7 brushes are on their way to you. We never knowingly sell inferior Series 7 brushes and we are happy to replace any faulty Series 7 brush so that you are able to benefit from the high quality of the Series 7 range.